2017 2nd Annual Pear Pie Eating Contest! 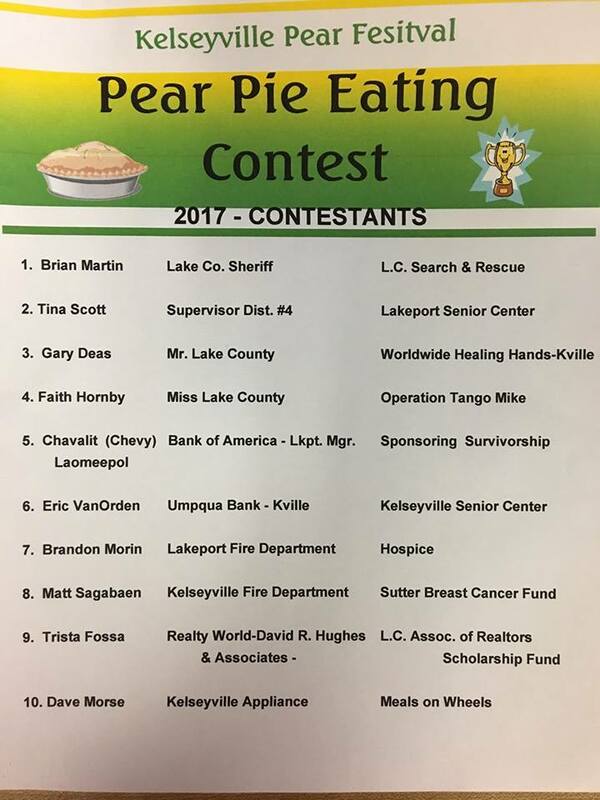 Ten local dignitaries, business professionals and community members will compete in a good old fashioned “pear pie” eating contest on September 30th, 2017 at the Kelseyville Pear Festival. The winner will receive a trophy and a $100 cash prize donated in their name to their chosen local charity. The contest was brought to the festival last year by Martha Rose owner of Rose Family Preschool Program in Lakeport who will again be sponsoring the event. “It was such a huge success and a real crowd pleaser with spectators cheering on their favorite competitor. It is here to stay adding more of that small town charm to the festival”, said Rose. The event will be held at 12:00pm on Main Street across from the Pear Pavilion. This year’s event will has some great rivalries between Miss Lake County and Mr. Lake County, the Lakeport and Kelseyville Fire Departments, Bank of America and Umpqua Bank to name just a few; all competing for a great cause. ​2016 Winner - Justin Sentak, Kelseyville Fire Protection District!